Canada Celebrates World Breastfeeding Week! Canada Celebrates World Breastfeeding Week! Hundreds of displays, newspaper articles, television and radio interviews during August 1 to 7 focused on the importance of breastfeeding for mothers and their children. News reports told the public that women had the right to breastfeed anytime, anywhere ; that breastfeeding provides optimal health for both mother and infant; that communities, institutions and governments need to act to ensure that all women are supported to breastfeed and that the artificial baby milk companies still continue to undermin e women's intent to breastfeed with misleading messages and free samples. Across Canada breastfeeding networks, breastfeeding supporters, women's groups, public health and hospitals took the challenge and their reports make encouraging reading for those of us at INFACT. New mothers from Saddle Lake, Alberta, who breastfeed for more than two months are awarded a Breastfeeding Empowers Women T-shirt, reports, Sheila Redcrow. A Mother-Baby-Friendly restaurant campaign was launched in Saskatoon, lactation consultant, Lorraine Khachatourians, tells us. Filmed by the local CBC, the launch received province wide coverage. "Le Meilleur Contenue dans le plus Beau Contenant" was the theme in press releases sent throughout Quebec by La Leche Quebec. Suzanne Dionne from Granby tells us there were numerous TV and radio ads, interviews and newspaper articles in many parts of the province. Photographer Bernard McCaffrey, whose photo of a breastfeeding woman and daughter breastfeeding her doll appeared on the WBW poster, Breastfeeding Empowers Women, has gained well deserved notoriety. Several newspapers throughout the Ottawa vall ey commended him for having his work chosen for the poster that was displayed across North America (INFACT received calls from as far as Texas telling us they loved the photograph!). He also reports that Pembroke city council refused to proclaim WBW until several women with infants and husbands in tow, confronted and informed the council. Molly Butler, manager of the BC department of Public Health Nursing assembled a breastfeeding information package which was sent to all BC public Health Units/Departments and Hospitals. Composed of bookmark, poster and information sheets on empowering women, the impact of pacifiers, baby bottle caries and the cost of infant feeding. From the Northwestern Health Unit in Kenora we hear that the town council proclaimed WBW and newspapers in all communities ran the WBW press release. 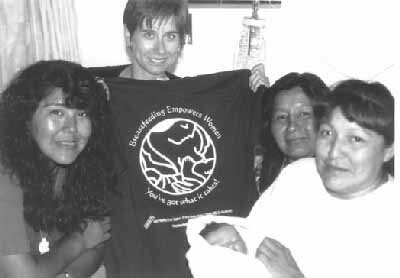 Interestingly in each community, a WBW t-shirt was given to the first breastfed baby born during August 1 to 7. In Kenora, Minwaabaminaagwad Odisabadamowinan Wiidookagewin (Brighter Futures Program), a program run by the Anishinaabe women, set up a mall display and produced laminated "You are welcome to breastfeed here" signs for store windows. Further south, health units in Ontario again overwhelmed us with their enthusiasm. Elgin St Thomas, public health nurse Isabel Resendes sent us a copy of the newsletter developed for health professionals who work with breastfeeding women. She writes, "In St Thomas we had the honour of having our mayor proclaim August 1-7 as WBW. An article with photographs was also published in several local papers. Displays celebrating the week were also put in our lobby and at the St. Thomas Elgin General Hospital." The Lambton County Breastfeeding Council had the week proclaimed by Sarnia's mayor, held a picnic, a mall display and were able to cancel a Mead Johnson "nutrition" seminar at the local YMCA! And Wellington, Dufferin, Guelph , Sandy Keller spearheaded a team of health and social service providers, local merchants and community supporters in an impressive number of events. 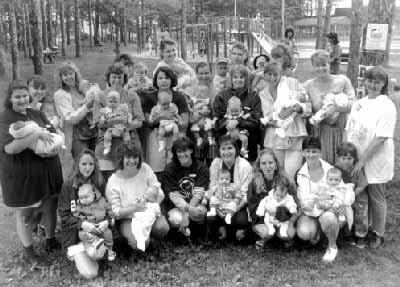 These included 11 restaurants with displaying "Breastfeeding Welcome Here"; community picnics in Fergus and Orangeville; special prizes for breastfeeding mothers giving birth during WBW; poster displays in malls, hospitals, clinics and community centres; photos and stories in local media throughout the week. Watch for more great stories in the Fall 95 Newsletter!